The massive, governmentwide efforts to consolidate data centers and squeeze more efficiency, cost savings and security out of cloud computing are not without their challenges. Both require new ways of thinking and a willingness to embrace change — two things that can be very difficult for entrenched bureaucracies that are uneasy with the perceived loss of control that comes with moving data to the cloud. To help us better understand the latest thinking on data center consolidation, cloud computing and the security considerations that go along with both issues, MeriTalk spoke with Brian Roach and Bob Dix of Juniper Networks. Brian Roach is Juniper Networks’ vice president of National Government and a 30-year veteran of the Federal IT market. His work with governments around the world offers a unique perspective. 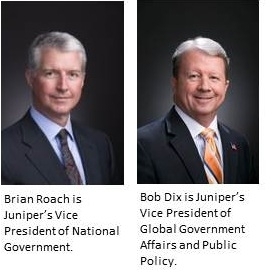 Bob Dix has led the global government affairs and public policy practice for Juniper Networks since its inception in 2006. MeriTalk: What are some of the latest trends, issues, challenges in Federal data center consolidation and the movement to cloud computing? Brian Roach: Data center consolidation and cloud computing have proven to be true catalysts for changes in the ways Federal agencies approach network management. Driven by directives like the Joint Information Environment, or JIE, and the U.S.’s “cloud-first” mandate, agencies have begun looking in earnest at ways to modernize their networks to accommodate current and future needs. At the heart of this effort is the need for greater efficiency. That’s why the Department of Defense has really zeroed in on data center consolidation as a primary objective. The JIE framework is key to that, as it’s designed to consolidate the DoD’s various networks into a single, massive entity that will, ostensibly, allow for better collaboration across agencies. But consolidation itself is a very large challenge, which is why we’re seeing agencies consider making the move toward software-defined networking, or SDN. Federal agencies are using SDN to simplify their network infrastructures and manage the entire consolidated network through a centralized point of control. SDN is also helping agencies add to the millions of dollars they’ve already saved through data center closures by allowing them to maximize efficiency. We’re also seeing a growing need for network automation solutions, especially as cloud computing continues to take off. While the cloud offers many benefits, it has also added an enormous amount of complexity to network management. It’s no longer sustainable or even possible for individuals to manage every aspect of the network themselves. Automation allows Federal IT managers to relinquish some of their network management responsibilities while helping the network run more efficiently without manual input. Automation also aids in security, which is always going to be a concern, since it reduces the chances of human error. MeriTalk: With the recent massive data breach at the Office of Personnel Management and similar intrusions at other Federal agencies, should Federal agencies be moving faster to consolidate and move to cloud computing? Bob Dix: Cloud computing has different advantages relative to traditional IT networks. The Administration’s cloud first policy provides that, when investing in new IT assets, an agency must evaluate cloud options before purchasing traditional systems. Before investing in cloud assets, an agency should conduct a thorough risk assessment to determine if cloud services would be more beneficial than traditional networks. At the same time, agencies should move smarter not just faster. Agencies that want to move to a cloud service should consider, just as they should with traditional networks, the security of the data centers and their equipment, how often the data is backed up, how is the data secured, and who might have access to the data. As a network infrastructure company, Juniper recognizes that many enterprises can benefit from cloud services, so we invest heavily in developing solutions for cloud data access, management, and security. MeriTalk: What will this cost an agency and is there any way to build on existing structures to tighten security and make systems work better? How does an agency ensure cost-effective security? Bob Dix: A primary responsibility of Federal departments and agencies is the stewardship of the information and data they gather and manage. That includes the protection of the confidentiality, integrity, and access of that information and data. Accordingly, cost is often not only monetary, but also includes impact on productivity and efficiency. Adopting an enterprise risk management approach to the security challenge will help inform investment decisions. Additionally, the culture of the acquisition process needs to move from one that focuses primarily on lowest cost, to one that instead considers best value in leveraging innovation to address total cost of ownership and meeting mission requirements for the end user and responsibility to the American taxpayer. In that same context, departments and agencies should adhere to current requirements in law, regulation, and Office of Management and Budget (OMB) guidance for full and open competition in Federal procurement. MeriTalk: Have the government’s data center modernization processes increased cyber security challenges? Bob Dix: Agencies should move smarter not just faster. Decisions about meeting government requirements for data center consolidation or moving to the cloud should be risk-based and the result of an assessment of risk rather than an arbitrary timeline. MeriTalk: What will it take to keep Federal agencies ahead of the game spotting cyber threats and establishing a credible warning system against attacks? Bob Dix: The government really needs to view industry as a partner in its cybersecurity efforts, not just in word, but in practice. Virtually every U.S. industry sector comes across cyber attackers in some way, whether it is banks that are targets of hackers and criminals or telecommunications companies whose networks are used to conduct nefarious cyber activity. At our core, industry and government have the same goal – to prevent unauthorized access to data or the disclosure of data. For that reason, we need a true public-private partnership to defend and protect against a common threat in cyberspace. That public-private partnership should include the maturation of a joint, integrated, public-private operational capability to improve the detection, prevention, mitigation, and response to cyber events that may have national or even global consequence. MeriTalk: What kind of products and services does Juniper offer? These fixes are more than just plugging the leak. What kind of commitment does an agency have to make? Brian Roach: Juniper offers products and services that help organizations modernize and optimize their networks for the best and most efficient performance. Specifically, we provide network management solutions, including switches, routers, and security devices, such as high-performance firewalls. Our solutions are highly reliable, offering five nine’s of availability, and support mission-critical networks across government agencies and service providers. We also offer network edge and identity policy and control services. The type of solutions we offer are very important for all organizations, but they’re particularly relevant for government agencies. To achieve their network optimization goals, agency personnel must commit to investing in solutions that will help them better manage and process the huge amounts of data and traffic that are becoming commonplace in the Federal space. Many of these solutions will be new to them, and the transition will take education and commitment. However, making the transition will help Federal agencies achieve their goals of having a fully optimized network that is well positioned for future demands. MeriTalk: How does Juniper’s Design and Architecture Center help agencies get up to speed? Brian Roach: Juniper is always looking for ways to provide customers with detailed information on how to build, manage, and evolve complex data centers, and our Design and Architecture Center is another example of that effort. Put simply, it’s an interactive site that helps agencies design and implement modern data center solutions. The site provides a great deal of useful information, from technical how-to and install guides, to videos on industry trends, and more. Previously, network managers could find this information across the web, but that can be cumbersome and confusing. With the Design and Architecture Center, we’ve compiled more than 80 curated assets that include a vast wealth of useful information. This information has been culled from industry experts, including network engineers and architects, so the information is presented in a peer-to-peer way. It’s a great resource for everyone, but particularly for Federal network administrators who are striving to modernize and consolidate their data centers. They can learn more by visitinghttp://www.juniper.net/documentation/en_US/design-and-architecture/data-center/index.html. Judi Hasson is a MeriTalk contributing writer.